It may be surprising to hear, but comedies are one of the toughest genres for us to curate on Short of the Week. After all, the internet is flooded with bite-size comedic films—from backyard sketches to innumerable “punchline” shorts. What makes one stand out from the other? What makes a comedy short memorable? Alexander Engel, the director of former Short of the Week Award Winner, This is It, seems to be answering that question for us. 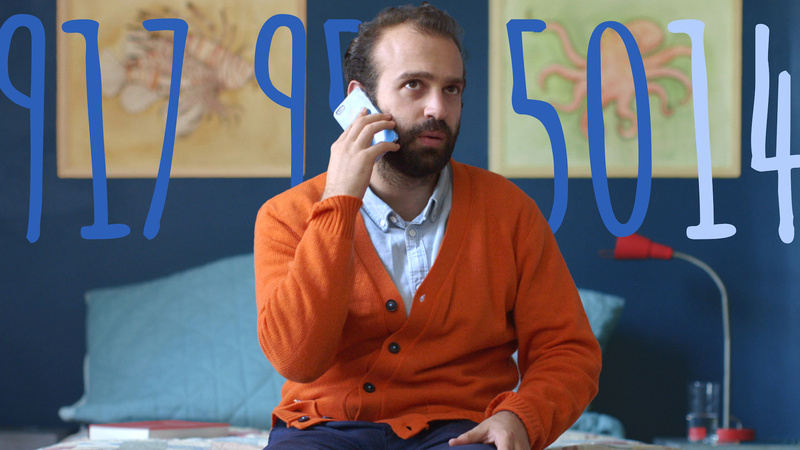 He takes simple, relatable premises (in this case, a dude trying to find the right phone number combination for a girl with whom he had a missed connection) and tells a story with both humor and heart. It may seem like a simple formula, but as someone who watches way too many shorts, I know from experience that it’s notoriously difficult to do well. And, yeah, Engel nails it. Digits is funny, but also developed enough from a character standpoint to feel substantial. An ocean nature documentary playing in the background serves as an undercurrent for the whole film. It’s an obvious piece of symbolism to be sure (plenty of fish in the sea! ), but it’s also surprisingly effective. That sort of cleverness is a representative example of the entire film—it’s cute without ever being cloying. While the structure of Digits isn’t as innovative as This is It’s “question only” narrative progression, Engel’s technical and aesthetic prowess still shows through. The film has a great sense of pace, carried through its runtime by impeccable editing (every cut feels purposeful). The protagonist—played by After School director Antonio Campos—is a little pathetic, but still incredibly relatable. Most impressive of all, the film does a lot with very minimal cinematic resources: just a single location and one actor. For me, shorts serve two functions— they’re a calling card and they’re practice. Needless to say, Engel has proved himself yet again to be a really strong comedic voice in the short form. Up next on his docket? He’s planning on developing a web-series called Dilemma, starring the lead actor from another short of his, Beardtown USA.